At the 1957 Canadian Open, Bob Panasik made history, surviving the 36-hole cut as a 15-year-old. Panasik would go on to play in 13 more Canadian Opens over the course of his career. He’s a two-time PGA Club Professional Championship of Canada winner, taking the title in 1981 and 1993. Panasik won the PGA Seniors’ Championship of Canada three times (1997, 1998 and 2001) as well as the PGA Super Seniors’ Championship of Canada twice (2003, 2004). 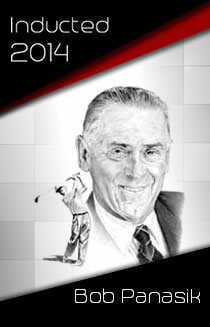 Bob represented Canada three times at the World Cup and was inducted into the Canadian Golf Hall of Fame in 2005.